The Suzuki holds its line and changes direction easily. The scene is the final hour of 1988 24 Heures De Leige at Spa in Belgium. Suzuki France lead rider, Herve Moineau, waits nervously in the pit, quietly preparing himself for his final session on the GSX-R750. After 23 hours of racing his teammate, Thierry Crine is leading by just 15 seconds from the Honda France entry. But it’s not just the race that’s being decided on the track it’s also the World Endurance Championship. The Honda pits first, Bouheben climbing exhausted off the ’87 model RVF that team manager, Jean-Louis Guillou, has entered in preference to the less reliable ’88 version. Alex Vieira mounts the Honda to the clak-clak-clak of chief mechanic Coulon’s air gun as the rear wheel is changed. Only 11.5 seconds have passed when Vieira blasts out of the pits. A lap later Moineau is staring intently down pit lane waiting for Crine to come in. The blue overalled mechanics ready themselves as they know the slightest mistake can cost them the Championship. Crine dives into pit lane and hands the GSX-R750 Suzuki to Moineau who is refuelled and out the pit in 6.27 seconds. Suzuki Team Manager, Domonique Meliand, stands by the pit wall, stop- watch in hand, ready to time the split as Moineau flashes by on his first flying lap, before flicking left then right through Eau Rouge and out of sight – but where’s the Honda! 45 seconds later Vieira’s Honda drones past. Word spreads down pit lane that on the last lap of his stint, Bouheben, who had heroically made up 13 seconds on the Suzuki, dropped the Honda at the bus-stop chicane before handing the RVF750 to Vieira. The race and the championship are Suzuki’s, beating their great adversary, Honda, in the last year before the series loses its World Championship status. Later that month half a world away, at Sugo in Japan, Suzuki scores its first win in a new production based World Championship, the World Superbike Series, with its new J model GSX-R750. Yoshimura pilot, Gary Goodfellow’s win, however, is put down to luck, as the first leg victory was more the result of a tyre gamble, and in the second leg, an oil spill affects the outcome of the race. Suzuki know they are in trouble as the privateers complain about the F.I.M.’s stock carburettor ruling, bemoaning the J models 36mm slingshot CV carburettors that won’t let the engine run cleanly at the top end, and even Yoshimura is having trouble getting horsepower from the new short stroke motor! 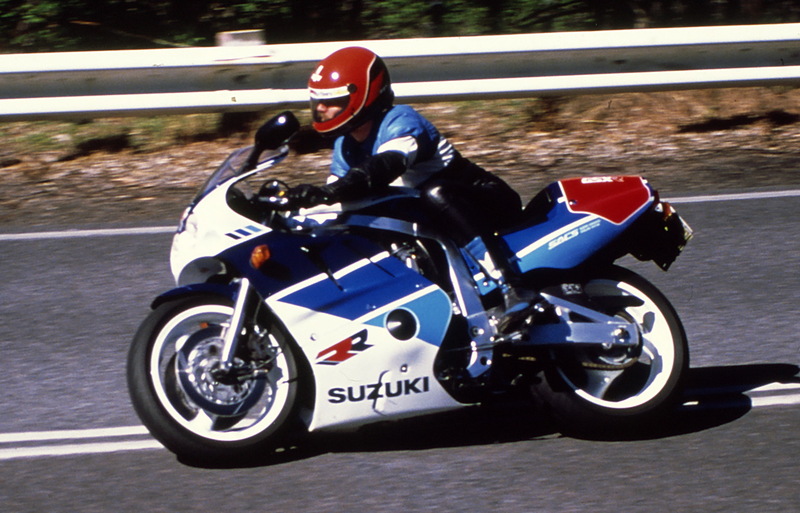 It was the culmination of these significant events that prompted Suzuki to produce a more competitive motorcycle for Superbike racing in 1989. Taking a leaf out of Honda and Yamaha’s book, Suzuki has released the GSX-R750R, built specifically for Superbike homologation, and basically a road-going replica of Suzuki’s Endurance World Championship winning machine and its F1 racer. Suzuki Australia brought 50 of these $19,950 beauties into Australia last September, with six earmarked purely for racing (no A.D.R. compliance and $500 cheaper) while the other 44 are fully road registrable. Jeff Zammit, the owner of Adelaide’s Suzuki South, was kind enough to let Bike Australia borrow his personal GSX-R750R for a ride impression. Jeff’s RR (I will refer to Jeff’s bike as the RR so as not to cause confusion with the standard RK model) had 800km on it when I picked it up but was fully run in after some careful kilometres on the road and a bit of stick on the race track. But before we go any further let’s have a look at what makes the RR cost $11,000 more than its similar looking stablemate. Suzuki looks purposeful but “pretty”. The heart of the RR is its engine, and there are plenty of changes. The carburettors are new BST 40mm CV items, up 4mm from the RK model and big enough to swallow birds and small dogs! They feature easier resetting for race conditions and have a high-speed power jet which allows a leaner main jet for better mid-range throttle response. Also improving throttle response is the atmospheric venting of the lower side of the carburettor diaphragm. On the RK this is vented to the air-box where intake pulses can affect the pressure under the diaphragm and in turn throttle response. A magnesium cover graces the factory-racer spec cylinder head, which features a valve system identical to the works racer and uses titanium nuts for valve adjustment. Spark plugs are a new cold-type dual-electrode design by either NGK or ND with a smaller thread size of 10mm. One reason for the change to a smaller thread size was to eliminate cracking in the combustion chamber that had occurred on RJ and some RK models used for Superbike competition. The RR also returns to the four-into-one exhaust system of the earlier models but with a lightweight stainless steel design that uses an aluminium muffler. Another significant change is the return to the old bore and stroke dimensions of 70.0mm x 48.7mm of the G and H model as opposed to the 73.0mm x 44.7mm of the shorter stroke J and K model. One of the benefits the longer stroke provides is more time regarding crankshaft degrees for the cylinder to charge, which in turn increases port velocity. The crankshaft is a high-rigidity lightweight unit, identical to factory racer, as are the conrods, which spins to the same 13,000rpm redline as the short-stroke RK model. Horsepower has increased over the RK by 8ps to 120ps at the same 11,000rpm and torque has improved from 7.9kg.m to 8.3kg.m again at the same 9,500rpm. The clutch has received an extra drive plate and the cooling system now features a curved radiator from the GSX-R1100 with a sub-cooler for the cylinder head to help deal with the increased thermal loads the optional $17,000 full race kit can create. The chassis looks the same as the RK but has been strengthened around the steering head, and the swingarm is also heavily braced. The front forks are of the inner- cartridge type, with beefy 43mm stanchion tubes that provide step-less spring preload and 12 positions for both rebound and compression damping. A Showa remote gas shock is used at the rear with preload varied by screwing the spring collar up or down while a knob on the remote reservoir handles the compression damping and extension damping can be adjusted from the bottom of the shocker. Wheel travel is 120mm for the front and 136mm at the rear, which is about par for the course for a serious sports bike these days. Steering head rake is 30 degrees with 102mm of trail which is a bit slower than the RK’s 24 degrees 50 minutes and 99mm trail although the RR has a 5mm shorter wheelbase. Racing riding position necessitates regular stops. The Nissin four spot calipers of the RK set a high standard for its class and are retained at the front, but utilise slit-type floating disks from the GSX-R1100. These are 5mm thicker than the RK’s and do a better job of drawing heat away from the pads, thereby reducing heat transfer into the calipers. Wheels remain 17inches in diameter with the front the same 3.5inch width, while the rear is a massive 5.5inch job that takes advantage of Michelin’s latest fat low-profile road going radial and more obviously the current crop of racing slicks. Tyre sizes are, up front an A59X 130/60 ZR17 and at the rear an M59X 170/60 ZR17. The fairing is a quick-fastening two-piece affair of high cooling efficiency and low aerodynamic drag. Suzuki has special sand-cast engine casings like those of the endurance racer to help reduce frontal area and give the RR a higher angle of lean. The front fender and seat cowling are identical to the factory bike, and all the bodywork is made from fibre reinforced plastic that’s suitable for racing conditions. The seat rear subframe is of aluminium/steel construction and for solo use only. A nice touch is the maintenance free battery that resides under the seat and is canted back at about 45 degrees so it will fit the confined space. It no doubt helps, in some small way, the centre of mass of the bike. Also, the seat bum pad is removable and can be unlocked with the ignition key. This reveals two small storage spaces, one of which houses the toolkit. The fuel tank holds 19 litres – 2 less than the RK and is styled after the F1 and endurance bikes. Visually the RR is quite stunning – purposeful, but with a rounded shape and curved lines that to my mind can only be described as “pretty”. It’s also very compact and weighs just 187kg dry (8kg less than the RK) which makes the RR seem smaller than its capacity suggests. My first impression when riding the RR was of discomfort, as the seating position is pure G.P. racer. 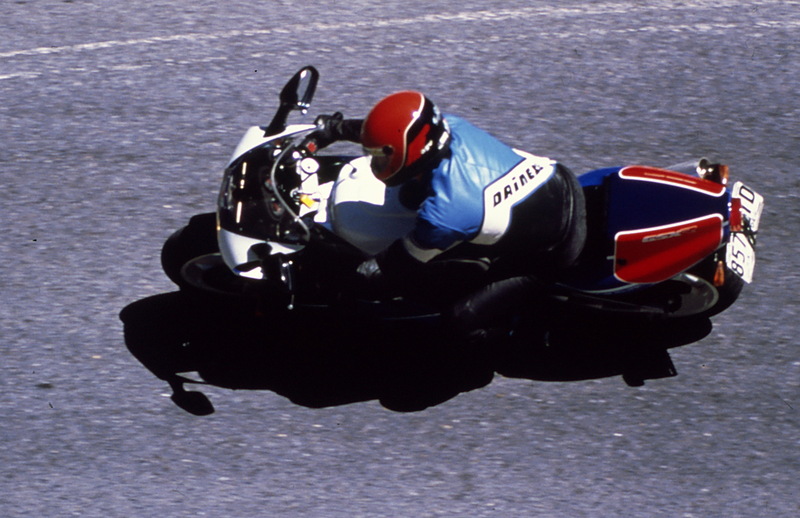 The clip-on handlebars are slightly lower than the RK’s while the footpegs are mounted more rearward – that combined with the angled seat force the rider to assume a serious racing crouch. That’s not a complaint, the whole purpose of the RR is to win races not cruise the main street. But while riding home from Suzuki South, along Adelaide’s bumpy Main South Road, the RR was telegraphing subtle messages that were all very positive. Getting off the line takes a deft hand as the throttle is very light which makes it easy to feed in more revs than necessary, as the engine has minimal flywheel effect and responds instantly. This is offset to a certain extent by the cable operated clutch which is smooth and progressive in its take up. The tacho starts at 3000rpm, but the RR will take off with about 1000rpm less than this no problem, even though it runs a very high first gear. Using the close ratio six-speed gearbox was a pleasure – even with only 800km of use. The engine spins very freely with little vibration just a faint rumble at around 4000rpm in the higher gears that are felt through the footpegs and seat. The RR will sit happily on 80kmh at just under 4000 revs in sixth gear and felt as though it would pull cleanly right up to its 13,000rpm redline. In this sort of stop-start city riding the dual electrode spark, plugs showed their mettle, allowing the RR to pull away from traffic lights with only the occasional slight trace of a stumble. I was quite surprised that the RR would tolerate such low revs and yet carburated so cleanly. Another pleasant surprise was the suspension, which had been set-up by Jeff for fast road work yet handled the bumpy conditions well by giving a firm but compliant ride. 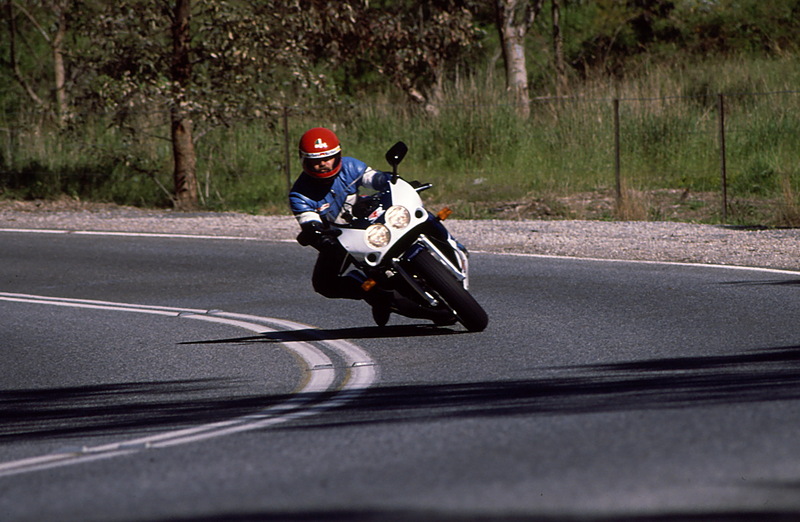 Two fingers were all that was required on the front brake as they are very powerful and combine with the riding position to make the rider feel sure the rear wheel is going to lift off the ground. The fairing did quite an excellent job in the warm conditions too, managing to get the hot air from the engine away without scorching the rider. Some hot air is deflected by heat shielding under the fuel tank, however, onto the riders forearms when stopped at traffic lights. I have to compliment Suzuki on the RR’s mirrors. 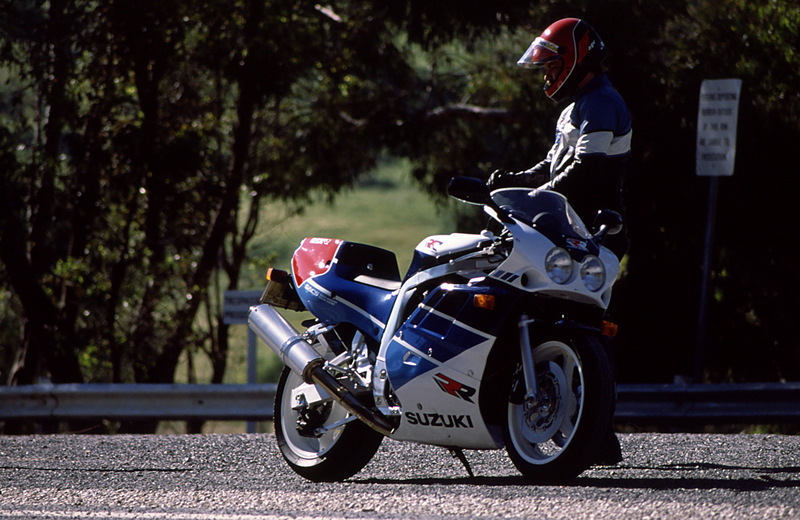 They are slightly convex, and an elongated oval in shape that gives a good view of the following traffic – not the riders elbows, nice one Suzuki. It’s an understatement that the RR was not designed for the hostile environment of city commuting, but the Suzuki accredited itself surprisingly well (apart from the riding position), but to really get to know the RR better necessitates a more appropriate habitat. The Adelaide Hills are crisscrossed with a great variety of scratchers roads, that vary from tight twisting turns to long sweeping curves – a natural place to head for with the RR. In these conditions, the RR is in its element. 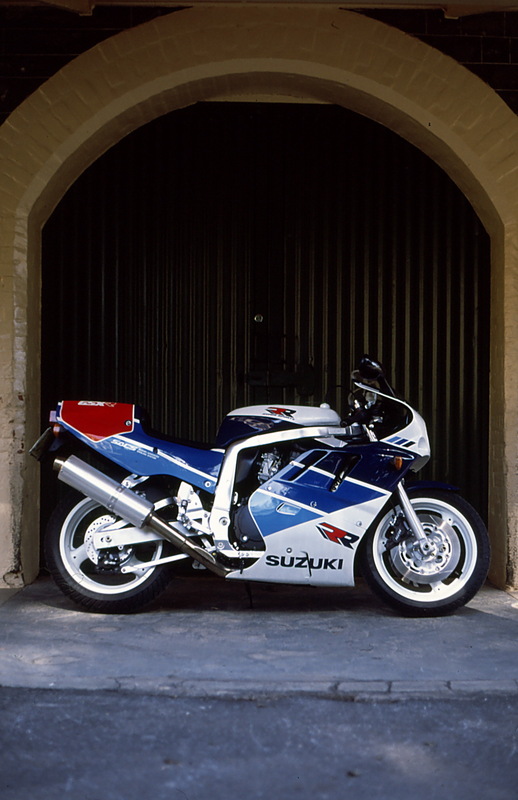 The Suzuki is so compact the rider can sense the centre of mass is just right, as the RR is so easy to flick into a corner, fast or slow, without any sign of top-heaviness that can affect an inline four in a double cradle loop frame. The steering is razor sharp too, and it’s easy to place the Suzuki on the right line into a bend or change it mid-corner for that matter. GSXR 750R in its natural habitat. The engine is a real gem, it just loves to rev and gives such a linear power delivery that there is no real jump in performance. On several occasion, when I managed to forget this was somebody else’s $20,000 motorcycle, my throttle hand got the better of me, and I ventured into this higher plateau of the RR’s performance. Apart from the feeling that somebody had put the scenery on fast forward the RR handled up-rushing bends in exactly the same. way A quick two-fingered squeeze of the powerful front disc brakes washed of excess speed, at the same time snicking down a couple of gears, tip the RR into the corner on the chosen line clip the apex and back on the power accelerating out. No protests from the chassis or tyres just rapid progress. On a couple of occasions, I did manage to get into a few corners a bit too hot and found that hauling on the brakes in a turn caused the RR to stand up and run wide, which on one particular off-camber corner caused the front-end to chatter. However I put this down to a suspension set-up for someone else, and a too tentative response to the situation from yours truly. High-speed stability was impressive also, the RR feeling rock steady in a straight line almost giving the impression of squatting down on the road as speed increased. The very effective fairing had a lot to do with this and made sustaining high speeds easy, helped no doubt by the tiny perspex screen which deflected the brunt of on-rushing air past the rider’s helmet with minimal buffeting. 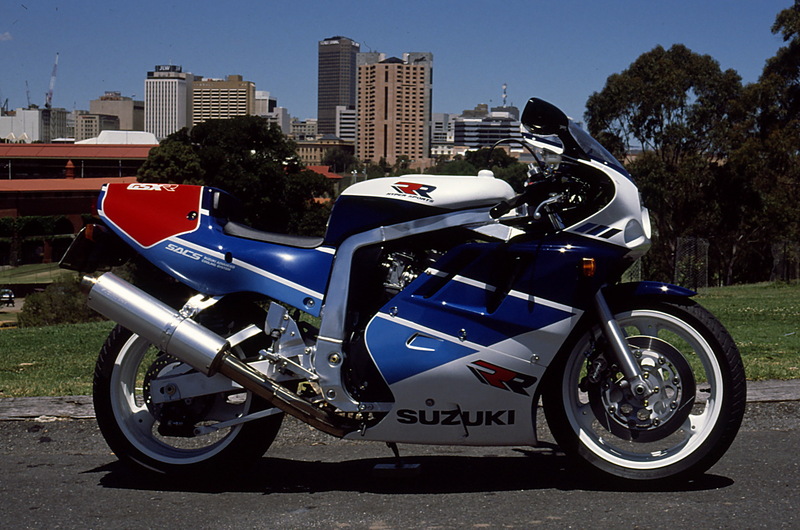 Feeling at one with the exotic Suzuki GSXR 750R. Is it worth $20,000? In my opinion, yes, it is that good. 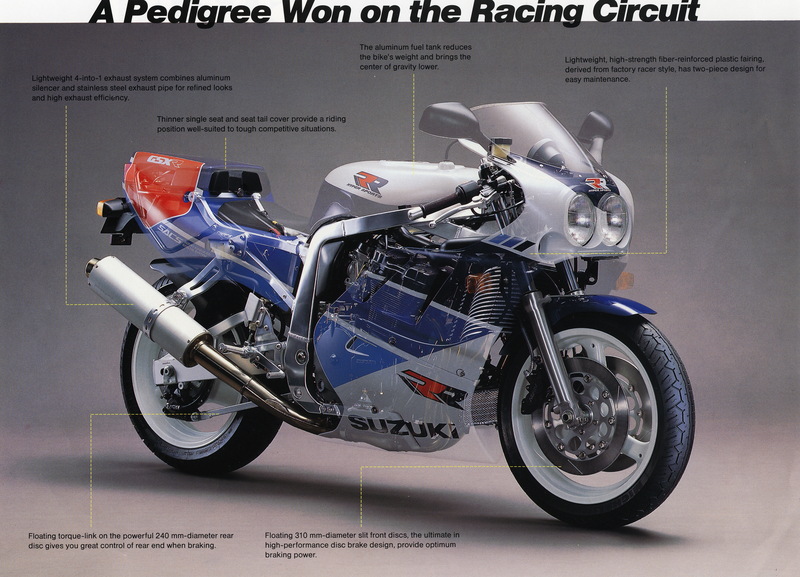 Suzuki has taken the evolutionary genes of their World Championship winning endurance racer and combined them with the DNA of their GSXR production model to create a racing thoroughbred. But perhaps just as importantly it shows what good value for the money its slightly less race orientated stablemate the Suzuki GSX-R750K is. Words Geoff Dawes (C) 1990. Photographs Geoff Dawes and Steve Frampton (C)1990. Published in Bike Australia May/June 1990. This entry was posted in Motorcycling and tagged Eau Rouge, Honda, Japan, Superbike World Championship, Suzuki, Suzuki GSXR-750R, World Endurance Championship on 19/09/2013 by Geoff Dawes.